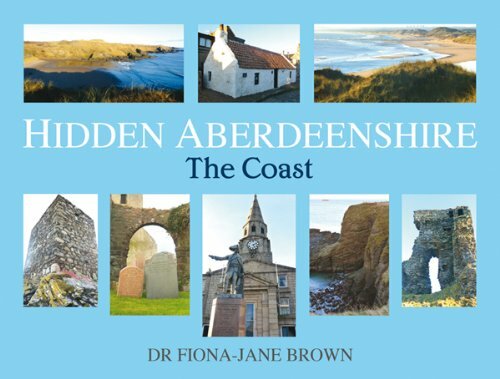 David Innes reviews Hidden Aberdeenshire: The Coast by Dr Fiona-Jane Brown. Hard on the heels of her well-received 2013 volume Hidden Aberdeen, Dr Brown shifts her authorial focus beyond the city boundaries to the traditional county of Aberdeenshire. More precisely, she visits its coasts abutting the North Sea and Moray Firth, along the way unearthing tales and anecdotes from the area’s fascinating history. An immediate tip of the hat to her for recognising that Aberdeenshire is a geographical and cultural entity, not a post-1974 local governmental fiefdom, a welcome approach for those of us who rant as Andrea or Norman refer crazily to ‘Banff, Aberdeenshire’ or ‘Gourdon, Aberdeenshire’ on STV News. Publishing in the same pocket-friendly format as Hidden Aberdeen, and maintaining its economical but fact-packed 450-word/two-page feature format, it is, like its predecessor, extremely readable and informative. Organised in discrete geographical areas, it will be easy for readers to visit most of the places in each section in a long half day, or even less. The excellent bibliography is a welcome additional resource for those who wish to dig a bit more deeply beyond the details in the book’s chapters. It has been said of Hardy’s Return Of The Native that Egdon Heath, the windswept wilderness on which the action takes place, is the dominating and defining character. Whilst the sea, its shore and fertile hinterland provide the canvas, Hidden Aberdeenshire celebrates the people who have enriched history and folklore of these lands over the centuries. Fascinating insights are given to the lives of flint miners, smugglers, heroes of shipwrecks, a war artist who chronicled the foreign exploits of TE Lawrence, Peterheid loon and unlikely Prussian hero Field Marshal James Keith and the proprietor of an ironically-named Blue Toon whorehouse. You will warm to the outcry raised by St Fergus’s villagers when a well-meaning restorer removed the extra minute from the village clock, smile at the account of Sir Arthur Conan Doyle being given a keeker in a boxing bout aboard a Peterhead whaling boat and be reminded of how impressive a modern cultural icon is the Pennan phone box. Just about all human life is within this extremely-readable compact volume’s pages, another triumph for the author. More please.